Glendon Westwood 4168 is located in Westwood Village near UCLA. 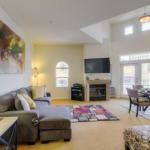 It is walking distance to a variety of grocery stores markets and restaurants. Guests get one complimentary parking space assigned to them upon arrival. The apartment is in a gated community with a newly refurbished pool area an indoor spa and a fitness centre. A full kitchen and washer/dryer unit are included in the apartment. Beverly Hills is 5.3 km away while Santa Monica is 7.2 km away. Century City shopping mall is 5 km from the property.